Measure the water into a bowl and whisk in the yeast, then 3 tablespoons of the oil. In a Kitchen Aid stand mixer, use the flat beater attachment and mix the flour, 2 teaspoons salt and rosemary on low speed for a few seconds. Add the yeast mixture and the milk while the mixer is running and mix for about 1 minute. Scrape the bowl and the flat beater with a rubber spatula and mix again for about 30 seconds. Remove the flat beater and cover the mixer bowl with plastic wrap, allowing the dough to rise until it has doubled in bulk, about 1 hour. Peel and thinly slice the onions. Cook them covered in 3 tablespoons olive oil in a sauté pan for about 20 minutes, until they just begin to color slightly. Season the onions with salt, pepper, 1/2 teaspoon of oregano, and cool. Spread 1 1/2 tablespoons of the oil on the baking pan. Turn the dough out of the bowl onto the pan. Pat and press it to fill the pan completely. If the dough resists, let it rest for a few minutes then continue. Allow the dough to rise again until doubled in bulk, about an hour. About 20 minutes before baking, set a rack at the lower third of the oven and preheat to 450 degrees Fahrenheit. Dimple the surface of the focaccia, using your fingertip to poke cavities in the dough at two-inch intervals. Spread the onions and scatter chopped tomatoes (optional) on the risen focaccia. Immediately before baking, sprinkle the top of the focaccia with 2 or 3 tablespoons of suchcoarsely chopped fresh herbs as rosemary, thyme, or sage. Drizzle with 1 1/2 tablespoons of olive oil, rosemary sprigs, and kosher or coarse salt. Bake the focaccia for about 25 minutes, until deep golden. Lift the side of the focaccia with a spatula or pancake turner to check the bottom about halfway through the baking time. If it is coloring too quickly, slide the pan onto another pan to insulate the bottom. 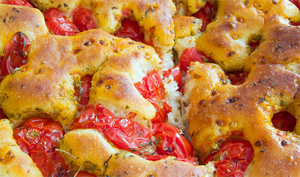 If you are serving immediately, slide the focaccia from the pan onto a cutting board. If you will be serving later, slide the focaccia off the pan to a rack to cool. Cut into narrow slices, or squares, or split horizontally for sandwiches. Yields 4-6 servings.